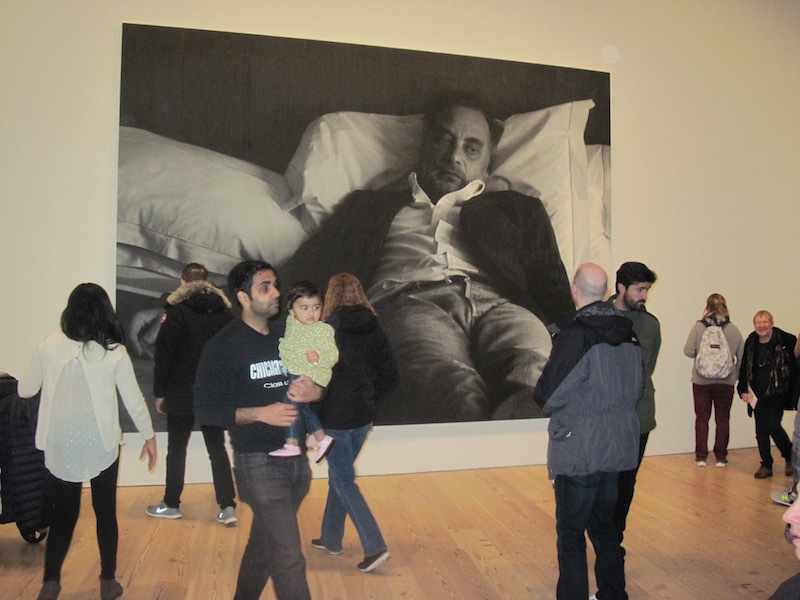 AT THE WHITNEY–FINE and OH PLEASE! 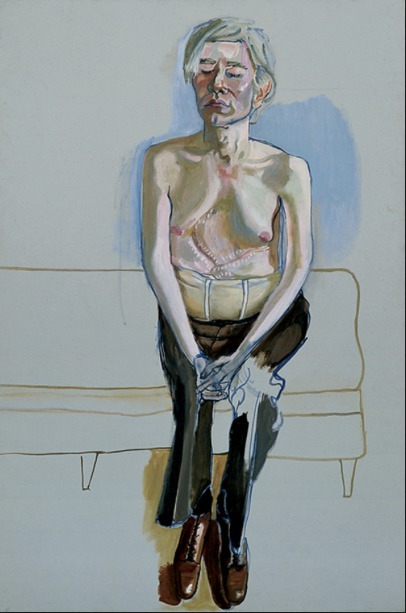 The current hanging at the new Whitney in New York includes several galleries of portraits. A mixed bag, as big shows tend to be. 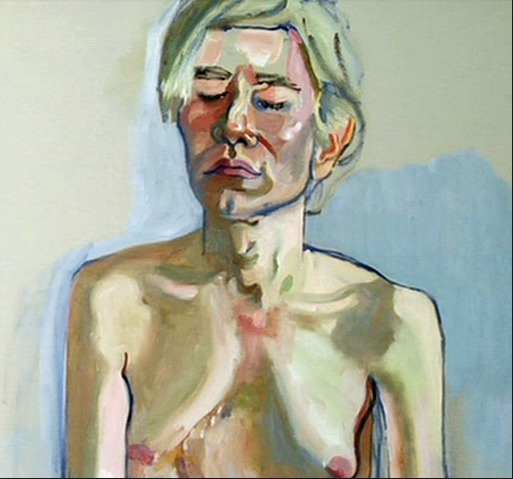 The standout on the quality side is this intricate portrait of Andy Warhol by Alice Neel (1900-1984), which I’d never seen in the flesh before. The whole composition is on the left; the colors in the detail are much closer to the real thing. The actual work, of course, is subtler yet. The thing about Neel’s best work is how she picks through what’s in front of her, and includes only what is essential to make her point. The couch and background are barely there; she scrubs in just enough blue to make the generally pretty cool flesh tones seem warm by comparison. The modeling of the body is wonderfully rich, but not pedestrian–she doesn’t want the hands, for example, competing with the face, so she leaves them merely in outline, and leaves the left knee almost untouched–we don’t need to be told about the left knee. But then she models the shoes fully to engage the eye wherever it goes. A fascinating and eccentric piece altogether. On the “oh please” side there were many contenders, but this “look at me”-size photorealist oil, “Untitled (after Sam)” by Rudolph Stingel represents the silly end of things pretty competently. The wall label informs us that “The despondency of his body language suggest a moment of melancholy, self doubt, or perhaps total exhaustion. . . Stingel has stated that the work is not a self-portrait but a depiction of him playing a role.” It is one of a series “of paintings of photographs of me posing. Like movie stills.” Okay, so I have to read the label to learn that it’s a painting that might mean this or might mean that or might mean nothing at all. I didn’t need to read the label by the Neel to be told what her painting was about. I could pretty well tell just by looking at it. Oh Whitney, where art thou?